There appears to be a gaggle of beauty events during fashion week. One of the events that caught my eye was for Armani. Why Should You Go: Tim Quinn will be dishing about fall trends and giving a sneak peek at the Rouge d’Armani lippie. This is the new lipstick from Giorgio Armani featuring 8 hour wear and a high dose of pigment. You will be able to purchase Rouge d’Armani #400 rouge and #600 plum way before the launch date of October 15th 2009. Let us know if you attend and if the lippies are lemming worthy! 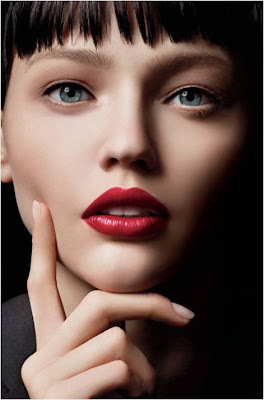 I seriously can't believe the amount of retouching they do on the Armani beauty model's face! Sacha Pivovarova always has the worst dark bags under her eyes and very grey skin from chain smoking.. This looks so unreal! The Nars fall 2009 ad (http://www.hotbeautyhealth.com/wp-content/uploads/2009/07/nars-fall-2009-collection.jpg) features a lovely purple lipstick that is reputedly Fast Ride. While I *love* that particular lippie, its colour is not even close to the one in the photo. Can anyone identify which lip product(s) they used on the model to get that fantastic shade of purple? Anon1: Her dark circles are very pronounced...but that actually makes me like her. There are so many of us that struggle with that. Plus I like her Blythe doll look. I will say that it is an odd choice for a beauty contract. Anon2: I hope someone can jump in with the answer. I have yet to see the Nars fall collection in real life. Our local counter did not have it out yet. I love Sasha in beauty ads. Her face and GA makeup styling are highly memorable. It demands attention. She sells the fantasy and I'm inspired by the image.